I moved to Chicago from Los Angeles where my husband and I decided to build our first home. During the process, I was looking for a designer in Chicago, but felt no one in the city had the laid-back LA sensibility that I would crave. I wanted a home that felt beautiful but casual at the same time, so I decided to try my hand at it. It was an easy transition from my creative jobs in Los Angeles, and fulfilled that artistic itch that I so desperately wanted to scratch. From there, it was friends and referrals that saw my work and really helped kick-start my life in design. There is nothing that speaks to our personalities more than art, and there are three pieces in my house that are my absolute favorites. We have a photo of Andy Warhol and his Factory that was supposed to be the cover of Time Magazine, but sadly JFK was shot, so it was replaced. The second piece that I love is an original Woodstock photo by Burk Uzzle. I struck a phone friendship with him a while back, and although he only sells to galleries, not to the public, I was able to convince him to sell me one. The other decorative object in my house that I love is my collection of antique worry beads from Greece, they have been gifted to me by family members, or found during some of my travels to the Greek islands, so they have a story, and a meaning. People say it’s both, but I think design is definitely an art. To be a great designer, you have to be creative and flexible. When rooms are placed just so, they tend to look uninviting and not lived in. To me, great design doesn’t have criteria and most times the happy accidents that happen in a room are the best part. I always like to think of design as an intuitive process; it’s something that can’t be explained, but you feel good design when you walk into a room. 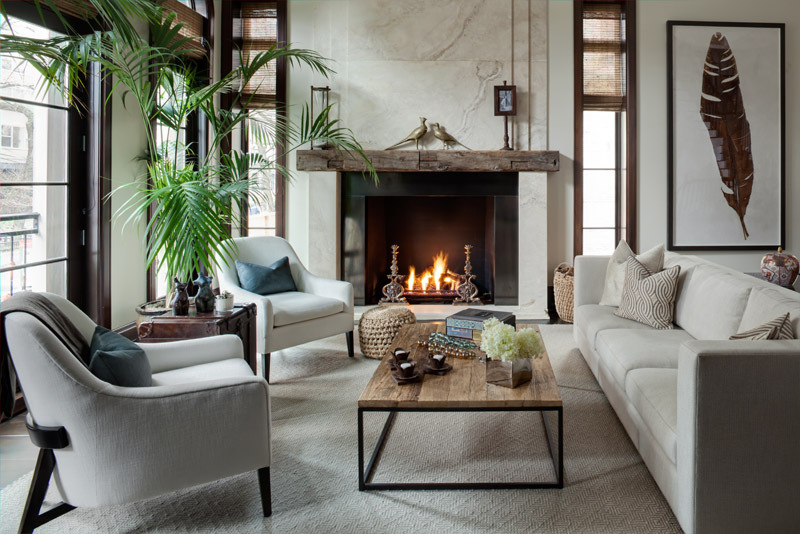 I love neutrals because it sets a calm and an ease to every room. I especially love black and white, and warm woods and metals. I do love color, but tend to stray away from anything trendy and bright. When I leave a room and feel that there is not one more thing I would add or one thing I would detract, then the room is complete. For me, the true test is when someone walks into one of my rooms and says it feels comfortable inviting, that’s when I know the room is complete. There are no rules to design and there is no equation for that perfect room. Take chances, mix elements, periods, textures, art, and accessories. A home should be filled with pieces that inspire you and that you have carried through your journey in life. When people design their home modeled after a showroom, or they purchase everything from a retailer’s floor. This doesn’t feel personal or curated. A home should reflect a life lived, it needs to show bits and pieces of your story and your personality. Talking to clients to see how they will utilize each room along with their design aesthetic really defines how each space will come together. Every piece I put into a home has a purpose and no question, it has to be comfortable. Fabrics play a big part in this because you want everything to feel luxurious and stylish, but also to serve the needs of the homeowner. It’s critical to make sure that the scale and the size of the pieces are right, because if a sofa or a table is too big or too small it will not just be uncomfortable, but it will also make the room feel unbalanced. I love to start with lighting, because it sets the tone for the whole house. To me, a great vintage chandelier or sconces are everything to a room. I also like to incorporate clients’ existing pieces, the ones they won’t part with, right from the beginning. As a leader in the industry for centuries, it’s wonderful that Sotheby’s has found a way to deliver both curated items and content to people who have a passion for design through Sotheby’s Home. The website is beautiful and I know that when I visit it, I am working with the best. Every piece feels relevant to what’s happening currently in design, and the imagery is perfection. 8 Pieces Inspired By The Style of Washington, D.C.